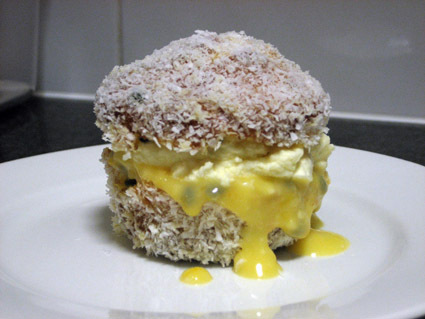 My husband picked this recipe from The Australian Women’s Weekly Cupcakes & Cookies book. I made them for him since August 31 is 5 months since we were married. It was a change for me because it had no chocolate in the recipe! The recipe was a little more involved than I bargained for, but not too tricky overall. Set aside some time to make these ones though. The cupcakes themselves were quite moist, with a real passionfruit flavour. I found 2 and a half passionfuits made 1/4 cup of pulp. Preheat oven to 180c/160c fan forced. Line 6-hole large cupcake tray with paper cases. Combine ingredients in a heatproof bowl. (I use a metal bowl). Place over a saucepan of simmering water, stir constantly until mixture thickens slightly and coats the back of a spoon. Remove from heat. Cover tightly; refrigerate until cold. Combine butter, sugar, eggs and flour in small bowl of electric mixer; beat on low speed until ingredients are just combined. Increase speed to medium; beat until mixture is changed to a paler colour. Stir in passionfruit pulp. Divide mixture among cases; smooth surface. Bake cakes for 20 minutes. Turn cakes, top-side up, onto a wire rack to cool. Dissolve the jelly in the boiling water. Refrigerate about 30 minutes or until set to the consistancy of unbeaten egg white. Remove cases from cakes. Roll cakes in jelly; leave cakes to stand in jelly for 15 minutes turning occasionally. Roll cakes in coconut; place on a wire rack over tray. Refrigerate 30 minutes. Cut cakes in half; fill with curd and cream.